Hello💙 Hope you have a great day! Today’s outfit post is about wearing stripes! While some people love them, others find them hard to wear. When we think of stripes we tend to think of regular blue or red with white sailor stripes. Those are the classic representation of stripes and quite easy to wear too. 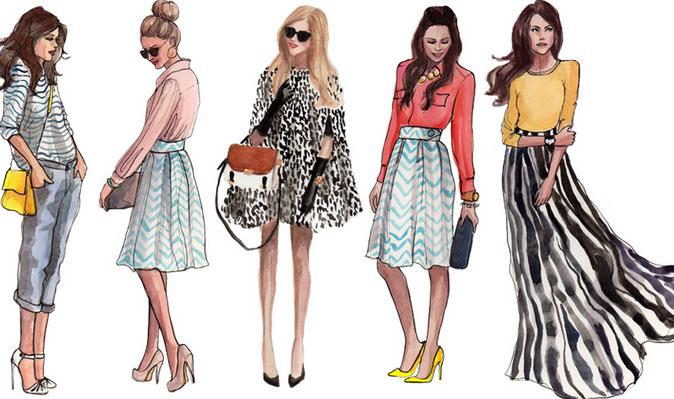 However, it could be daunting to think of wearing stripes like the ones below (even though it shouldn’t! ), especially if your style is geared more towards minimalism. To wear stripes that involve so many colors, my main tip is to focus on one color only. As you can probably guess, I decided to highlight the blue. I chose gold and blue accessories and a navy blue Ted Baker satchel to allow the other colors in the top to “shine”, instead of drawing too much attention elsewhere. I really love this top because it’s one of those that you can dress up or just wear with jeans and it will instantly make your outfit look good. Next Next post: Hairstyles I’m Currently Loving!